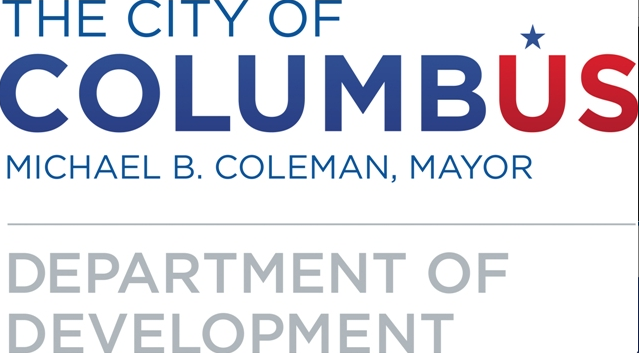 The City of Columbus Public Art Program seeks to commission a professional visual artist/artist team to join the Parsons Avenue Streetscape Project being undertaken by the Columbus Department of Public Service. The deadline has been extended until June 8th at Midnight. 2) Create a site specific artwork or artworks discrete to, or integrated into, the new Parson’s Avenue streetscape. 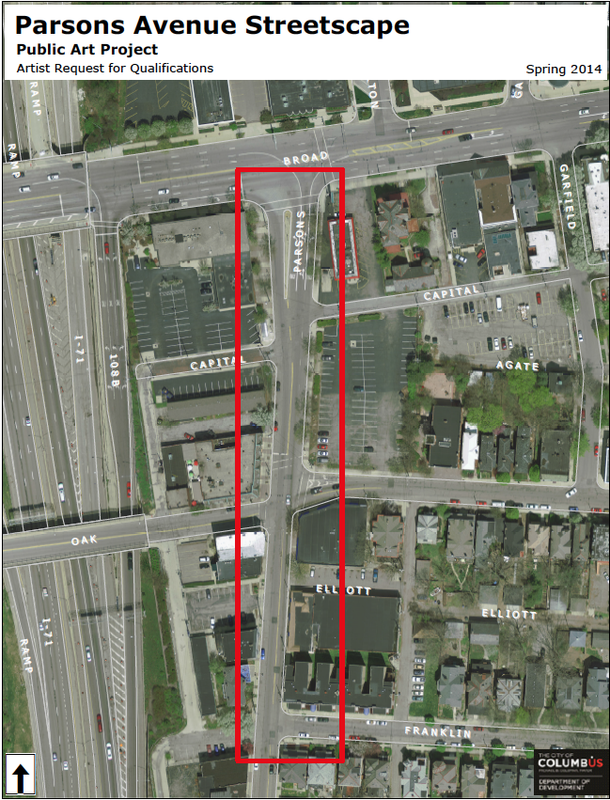 The project will focus on Parson’s Avenue corridor between Broad Street and Franklin Avenue. 1) The CAC will seat a seven member Artist Advisory Panel to evaluate the submissions. The Panel shall review qualifications (images of past work, resume, letter of interest and references) and select up to three artist/artist teams as project finalists. 2) The Finalists will interview with a secondary Artist Selection Panel that will include the project design team (engineers and landscape architects/architects), designated City of Columbus project staff and two members of the Artist Advisory Panel. The Artist Selection Panel will recommend one artist/artist design team finalist and one alternate to the CAC for the project commission. 3) The CAC will review the finalist and alternate artist/artist teams for approval. The public art budget is $100,000, all inclusive (design team participation, community discussions/research, design, fabrication and installation, including permitting fees, travel, shipping expenses, insurance and other project related costs). The design fee (included in the $100,000 budget) is 10% of the total art budget or $10,000. The public art project will be funded through the City of Columbus Capital Improvement Program. -June 26, 2014 The CAC will review the finalist and alternate artist/artist teams for approval. **FREE to register through GCAC GoArt Platform. Just create a login and you are on your way to apply! Visit Parson’s Avenue Streetscape to apply. Lori Baudro, AICP, Project Coordinator, Columbus Planning Division, 50 W. Gay Street, Columbus, Ohio. 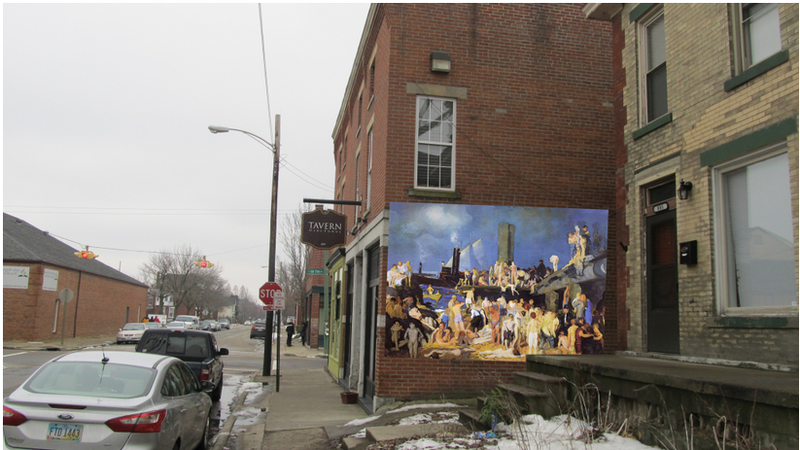 The Olde Towne Arts Association is pleased to announce that the George Bellows Mural Project is now live! 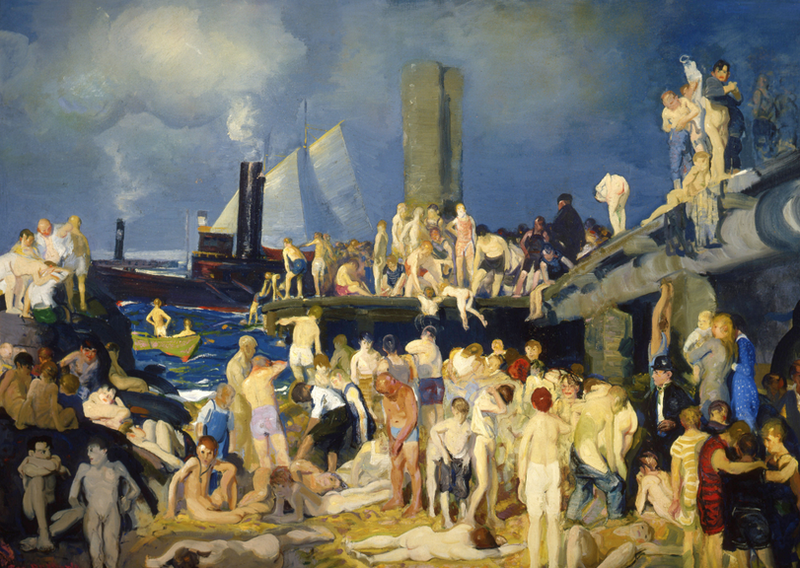 With the permission of the Columbus Museum of Art, the OTAA will reproduce Riverfront No.1 by influential co-founder of the Ohio Art League and acclaimed artist George Wesley Bellows on the side of the popular business “The Tavern” on Oak St. in Columbus. The Olde Towne Arts Assoiation aims to help foster an economy which financially supports the arts by creating more paid opportunities for artists and to celebrate and promote Olde Towne East’s rich artistic heritage. 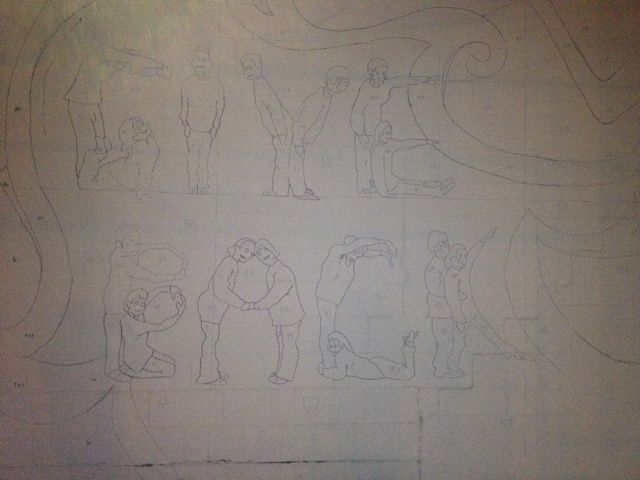 The mural will be created by Roger Williams, a long time Olde Towne East resident and award winning artist. Roger has sucessfully installed numerous murals throughout the city of Columbus. With your help, yet another neighborhood may exhume arts and culture amidst the beautiful backdrop of our fair city. Anyone interested in making a tax-deductible donation to the project via the Olde Towne Arts Association Indiegogo page. If you live in Olde Towne East, please email the OTAA to find out the date and location of the next meeting. You may find contact information, details about the project, how to help, or other great events the Old Towne Arts Association puts on by visiting the homepage here! Harmony Project’s award-winning program “One Week, One Neighborhood” comes to Franklinton during National Volunteer Week. This year Harmony Project sought out Ohio Art League in hopes of creating a collaborative art mural for the outside wall of the Boys and Girls Club and for all the Franklinton resident to enjoy. Ohio Art league artists Jonathan Ryan and Cyrus Fire collaborated with Harmony Project’s artist Jeremy Jarvis to design the mural. 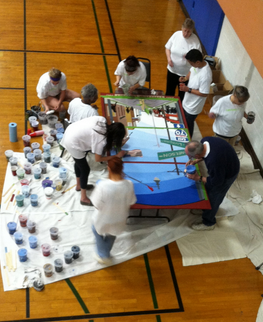 During the week volunteers are able to come and paint the mural. A great activity for family and friends, the mural is paint by number. Come out and be part of the mural! April 21-24th from 9am to 3pm DAILY for volunteers with landscaping, mulching, planting trees and flowers, building a meditation garden, and restoring some of the rooms of the Boys and Girls Club. The rich and culturally diverse Franklinton community is celebrated as people roll up their sleeves and work with others from across Columbus to leave their community better than they found it. “For You & Me” celebrates the diversity of Columbus by uniting Franklinton residents and business owners with neighbors from other parts of our great city. It’s a chance for Franklinton to introduce itself to many who know very little about it…and an opportunity for our city to grow stronger through the bond of collective volunteer service. Come out and lend a helping hand! Remember, its National Volunteer Week and Earth Week!